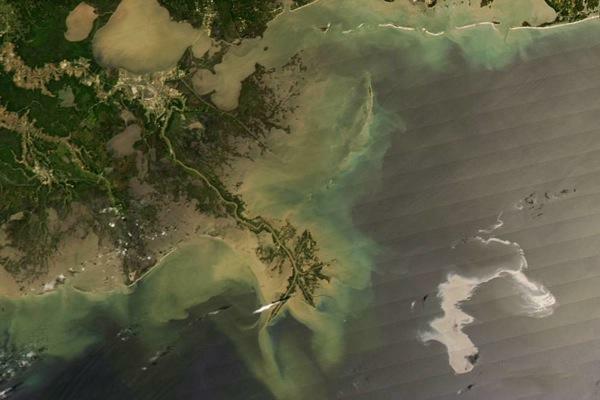 The 2010 Deepwater Horizon oil slick as seen from space (Credits: NASA). What does a NASA safety engineer do when his shuttle’s been retired and his agency’s downsizing? He signs up with the oil industry. It turns out that many of the risk assessment methodologies and safety culture elements that NASA employees have honed over the the past decades translate quite nicely to the oil industry, according to recent reporting by Fuelfix‘s Emily Pickrell. For those once stationed at NASA’s Johnson Space Center in Houston, the oil business is practically a no-brainer, integrated as it is in the fabric of Texas life. And, just like NASA in the aftermath of it’s two shuttle accidents, the 2010 Deepwater Horizon incident made it clear that the oil business has some cleaning up to do. The oil industry has treasured its rough and tumble wild west image, but with costly spills biting into profits, some companies are finally seeing the light when it comes to choosing risk mitigation over seat-of-the-pants operations. “They look at what may happen, instead of just producing the work, and that is something that other industries value,” says Veronica Reyes of former NASA employees. “That kind of contingency planning and awareness is hard to teach, but it is ingrained at NASA.” Reyes is a human resource manager at the Aerospace Transition Center which helps laid off aerospace employees find jobs in other industries. NASA veterans know how to follow procedures, constantly evaluate safety impacts, and already hold security clearance. With fewer than 20% of laid off NASA workers remaining in the aerospace industry according to some estimates, the oil industry may be one crowd applauding the retirement of the Space Shuttle.